French cuisine has a deservedly high reputation. Both the French classic cuisine and the French country cuisine have given us a series of notable dishes worthy of repetition, IMHO, even though the emphasis on butter and cream in the classic repertoire may be a little, shall we say, passé by more modern standards. Direct injections of cholesterol directly into one’s arteries are best applied only occasionally. Not every dish is complex, though, particularly when it comes to the excellent French seafood. Spankingly fresh fish and seafood require little in the way of culinary attention to make them a noteworthy gastronomic experience. One example of simplicity at its best is moules et frîtes [mussels and chips] which, though it can be sampled pretty much country-wide, is more prevalent in the mussel growing areas of the French coast, one of which is nearby. The day looked a little grey and windy so we decided to pop over to the coast above La Rochelle, a distance of about 25m/40km, with vague thoughts of sampling some moules et frîtes. On a previous year’s trip we had tried and failed because we went on a Sunday with no reservation – pas de reservation, pas de table. The French love their Sunday lunch out. Once again, frequent arterial injections of cholesterol should be minimized but chips once or twice a year shouldn’t be too problematic; maybe we’d have more luck on an out of season weekday. 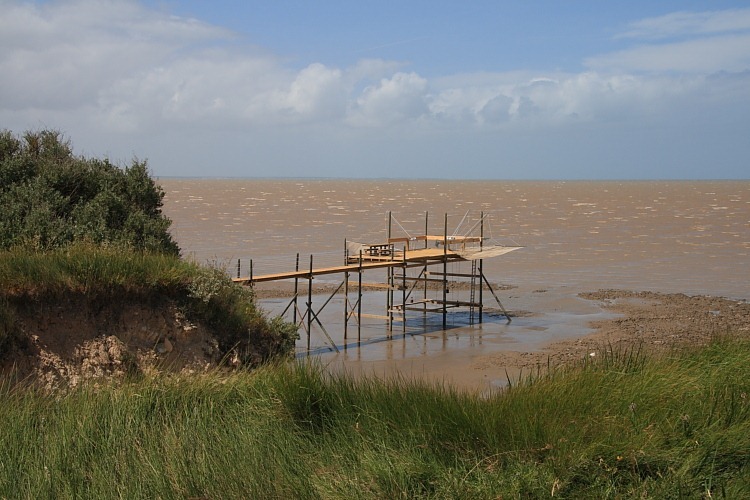 We arrived at the bay in question, Anse de l’Aiguillon, to be greeted by a very stiff on-shore breeze and the sight of a tractor parked perilously close to the incoming tide. All was revealed a little later as a small boat approached as close to the shore as possible and dropped off one of its crew who proceeded to wade through the surf towards the tractor. I found the image of the man walking out of the sea towards the tractor irresistible – sort of Reginald Perrin in reverse. He clambered in, fired up the tractor and began to back it and its trailer into the sea to recover the boat and crew. Off they then drove. Here, in fake Fuji G617 format (I can’t afford one), is a small sequence to give the idea. Playing this game obviously requires an intimate knowledge of the local tides. In addition to wading fishermen, the bay also boasts some dangerous falaises [cliffs], out from which are built several equally dodgy-looking but quite photogenic fishing platforms with suspended nets. We’ve seen similar constructions in other parts of France so I they must be quite popular though we’ve never witnessed them actually in use.